1.4 What Do They Eat? Terrible thrips! They invade the garden, sucking the juices out of leaves and stems and the life from your plants. They cause scarring on fruit and vegetables and spread plant diseases like the tomato spotted wilt. Finding them in your plant beds is never a good thing, because by the time you find them, they’re often widespread. Thankfully, there are some things that we can do to wipe out these pests and keep them at bay. 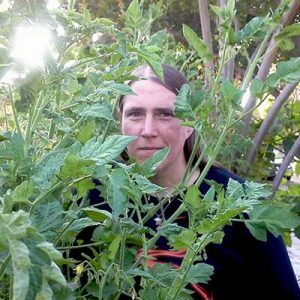 I’ll go over what they are, what they do to your plants, and how to stop them. Plants Affected Most commercially-farmed crops, many ornamental plants, trees, etc. There are many different varieties which prefer particular plants, such as onions, tobacco, cannabis, rose, avocado, and citrus. Common Remedies Insecticidal soaps, neem oil, pyrethrin sprays, diatomaceous earth, kaolin clay, predatorial insects (ladybugs, lacewings, Trichogramma wasps, minute pirate bugs, thrips predator mites), sticky traps. 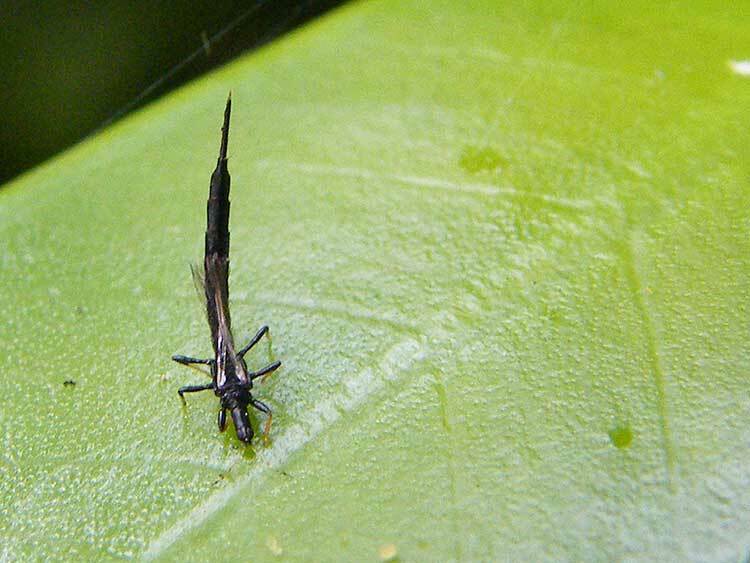 Thrips are long, slender insects that are rarely over a quarter-inch in length in their adult form. Yellow, black, or brown are common colors for adults, and the larval stages tend to be yellow or green. These insects fall into the Thysanoptera order of insects. Some varieties have fringed wings, but they are not strong fliers. Others have mostly vestigal wings that don’t work at all. There are over 4500 species, and some indications put it closer to 6000. While there are varieties which wreak havoc on your plants, other types are actually beneficial. These beneficial species will attack and consume other insects, including other varieties of thrips. It’s difficult to tell the good ones from the bad, so most people opt to simply eradicate them all. Females are capable of producing eggs asexually if they lack a mate. Unlike most caterpillar species, they eat or rasp out a hollow in plant matter in which to lay their eggs, providing them shelter from potential predators. The eggs are shielded from weather conditions in the soft tissues of the plant. When they hatch, there’s a food source at hand. Most go through two larval stages as nymphs before becoming adult. A few types have more larval stages, some reaching as many as five. Once they have reached the end of their nymph development, they will pupate and become adult. This process can take 8-15 days during warm weather, and as long as a month in colder weather conditions. Some varieties can enter diapause. Diapause is almost like suspended animation. 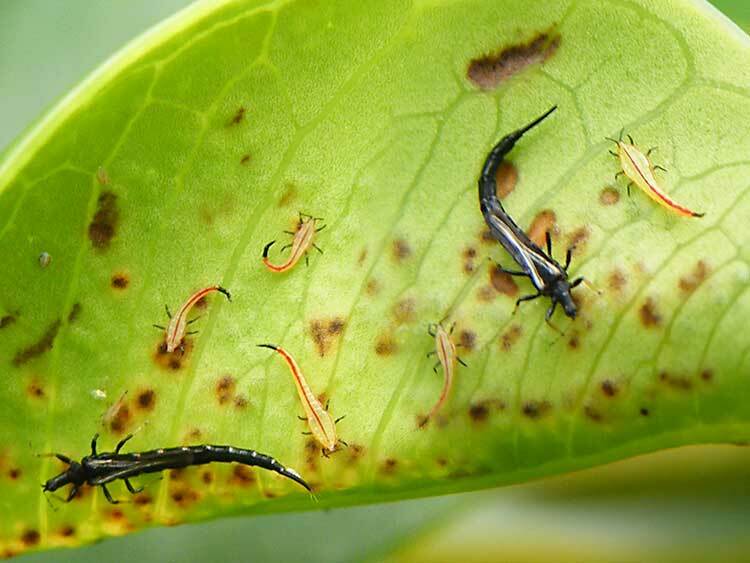 Thrips can survive like this as adults, pupae, or eggs. The average lifespan for these bugs is about 45 days. Here’s an interesting video on these pests’ life cycle! Throughout the winter months, thrips bury themselves under leaf cover, dig underground, or occasionally infest locations such as the walls of houses or sheltered parts of fences. In the warmer months of the year, they live on and around the plants that they are consuming. On trees, that will often be in the leaves and bark of the tree. On other plants, it will be on the leaves or stems or in the flower blossoms. Most of the pest types feed on plant juices. They bite or saw their way into the plant stem to drink from it, or use their syringe-like mouths to extract liquid from leaves. These pests infest most commercial food crops. 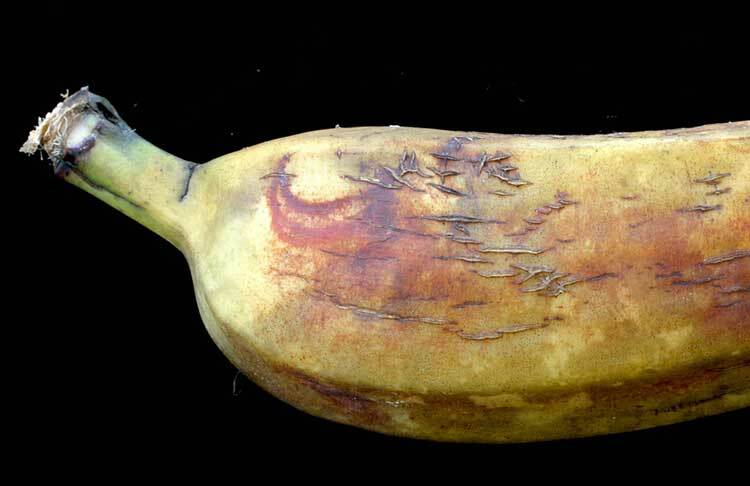 They can scar fruit or vegetables on the surface, causing damage to the fruit. There are also varieties that will infest roses, trees, or other ornamental plants. As they lay their eggs inside plant stems or stalks, it can be hard to find the eggs. 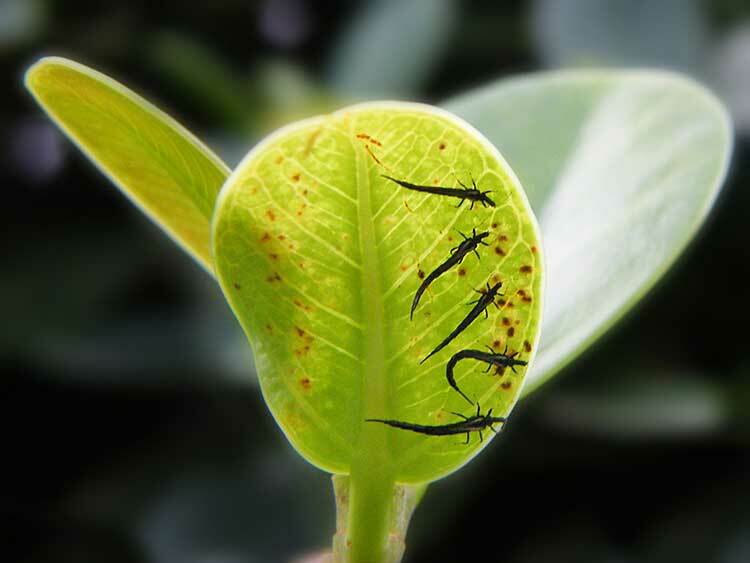 It’s important to check for adult or nymph stages on blossoms, leaves, or stems. There are some varieties that are beneficial. These species tend to feast on other pest types, including mites and aphids. They also will eat plant pollen when pests are not available. It’s very difficult to distinguish between the good and bad types of these bugs. 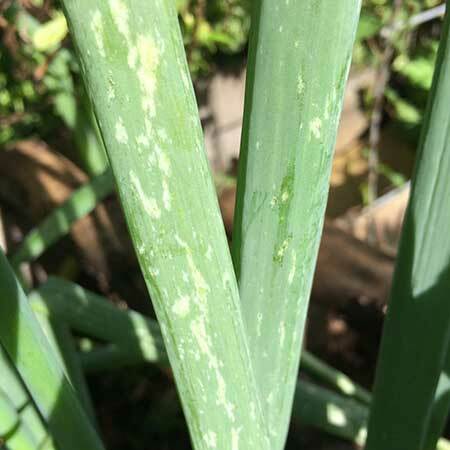 Generally, if you see no damage on your plants, but you do see the thrips themselves, you probably have the good type and do not need to be concerned. Some species are developing resistances to particular pesticides. The pesticides will still kill these pests, but it may take longer to wipe them out. If you follow the below steps, you should be able to eliminate thrips from your yard and protect your plants from future attack! Insecticidal soaps or insecticides may be necessary for moderate infestations. A product such as Safer Soap applied heavily on all surfaces of the plant will kill what’s on your plant and discourage new thrips from moving in. For a slightly more potent combination, mix some neem oil with some of your insecticidal soap. The neem oil adds an extra layer of killing power while remaining environmentally friendly. Especially bad outbreaks may require more powerful options. At that point, use a pyrethrin spray such as Safer Brand Yard & Garden Spray, which combines pyrethrin with fatty oils to smother and poison thrips. Eliminate grass and weeds around your plant beds. Thrips can live in grassy or weedy locations. Similarly, remove any plant debris around your plants to remove a potential home. Keep your greenhouse clean. A cleaned greenhouse that is bare of plant debris is less likely to develop pest issues. Don’t forget your beneficial insects! There is a type of mite called the thrips predator mite which will happily eat your thrips, as well as spider mites and pollen. The minute pirate bug also eats them. Ladybugs and lacewings are both great at reducing populations. Finally, the Trichogramma wasp is known to destroy some varieties. Inspect new plants before introducing them into your yard or your greenhouse. 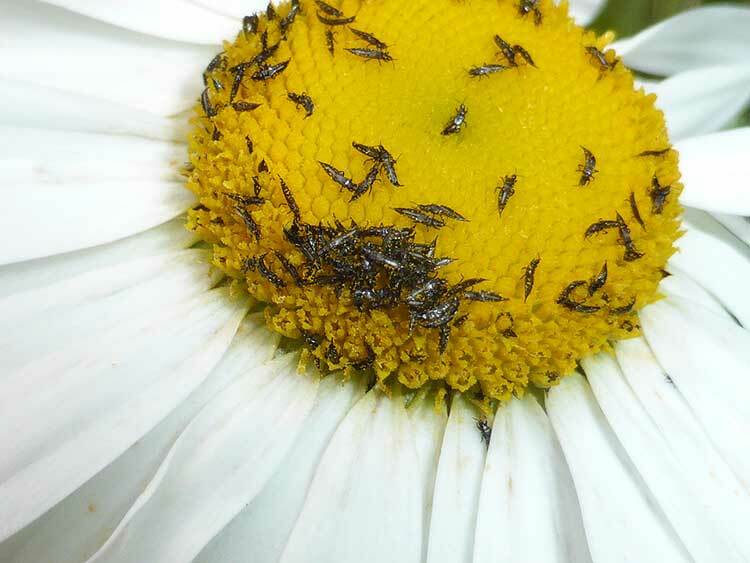 These irritating little pests will spread quite rapidly from the new plants to older ones. It may be wise to keep plants separated in a quarantine area away from your greenhouse or garden for a couple weeks so that you can keep an eye on them. 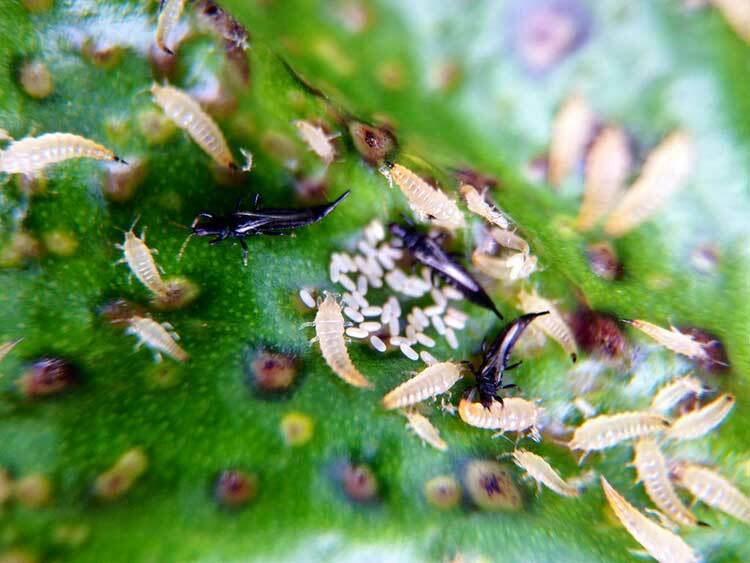 Thrips tend to avoid plants which have been liberally dusted with diatomaceous earth or kaolin clay. Diatomaceous earth feels like knife blades to small insects. Kaolin clay coats the plant’s foliage with a gritty dust that insects do not like. Adultscan be caught on sticky traps. Hanging these around your plants will help to reduce the population numbers. Q: Will nematodes help keep my thrips population down? A: Yes and no. As thrips often overwinter and pupate in the soil, beneficial nematodes can be helpful at wiping out any underground. Since most of the population is made up of adults or nymphs who are above-ground, nematodes should not be your only beneficial insect addition. However, they won’t hurt, and they can help kill off a number of garden pests! A: Yes, they do. While thrips aren’t harmful to humans or our pets, people who have sensitivities to bug bites might experience some slight irritation. Usually, washing the bite in warm to hot water with soap will reduce any itching it may cause. It’s more of an annoyance than something to be concerned about. Q: Are there greenhouse thrips? A: Thrips are almost as much of a problem in greenhouse environments as spider mites are. Hanging sticky traps around your plants and being vigilant should keep the population down. If you do find thrips in your greenhouse, use insecticidal soaps, neem oil, or pyrethrin sprays to wipe them out. Q: I heard milk will kill thrips. Is this true? A: Scientific studies are being done to investigate the use of milk in garden settings. An interesting paper was released from Punjab University in India which suggested that on roses, milk could help reduce the spread of aphids, thrips, and spider mites. More study is still needed to compare milk’s use to other organic pest control methods. If you’re curious, you can read the study’s findings at this site. I’m going to use all the tips i can to eliminate all from my onions orange tree and lemon trees. Glad to hear that works well! Keep growin’ Alec!